Our Annual Chemo Care Package drive has started for 2018. This year we set a goal to sponsor 1000 Cancer Patients in the Fayetteville, Fort Bragg and surrounding cities! 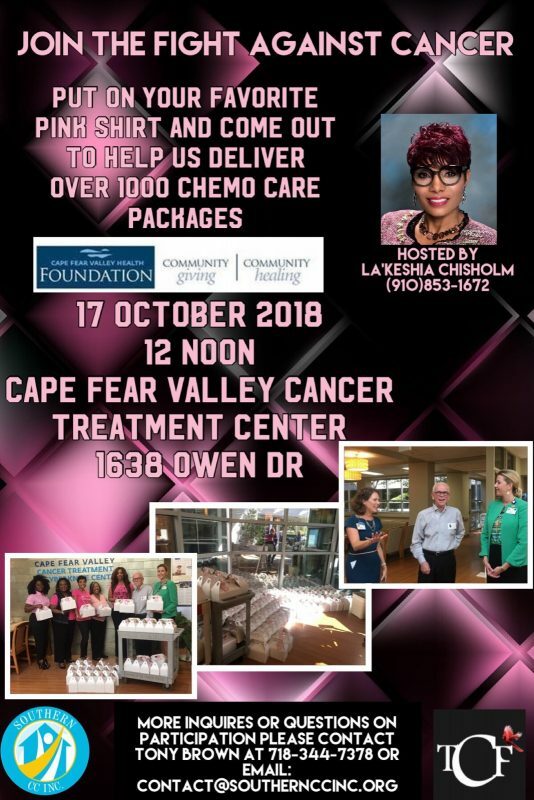 The Chemo Care Packages will be delivered to the Cape Fear Valley Cancer Treatment Center and Ft Bragg Womack Army Hospital to bless their Cancer Patients! We are looking for companies and individuals to help us reach our goal by purchasing a Chemo Care Package for $30.00 per Cancer Patient. Each package will be beautiful and have feel good items for their skin after Chemo treatments inside each box! We definitely need you help to reach our goal! Southern CC, Inc. delivered 1000 Chemo Care Packages to Cape Fear Hospital for Cancer patients.